November 25 marks the anniversary of a dream come true. This is the story of our African wedding as it unfolded in the pages of my hand-written travel journal. November 24, 1999 Ngorongoro Crater. Full Moon. Fur blankets drape a king size bed in the Kimba Suite with glass doors overlooking Ngorongoro Crater. The moon is full and bright, and the lake below glows silver in her reflection. We are on the rim, 8,500 feet up, and below is a vast caldera crawling with wildlife. This place is spectacular. There are simply no other words to describe it. November 25, 1999 Ngorongoro Crater. OUR WEDDING DAY!!! As the sun rose and crept over the opposite rim of the crater, we were whisked off escorted by Shawnab, Francis and Shaibu. The moment we emerged from our room, Shawnab took my camera bag and handed me flowers. The other cameras flashing as we walked through the lobby was the sign of a very special event, which I soon came to realize was our wedding. I don’t think either of us had any idea just what a production this would be. 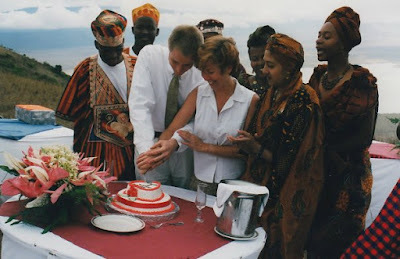 Apparently we were the first non-Maasai to get married at Ngorongoro Crater, and the first wedding of any guests to the Ngorongoro Serena Lodge. We were escorted out to the jeep with colorfully dressed hotel employees following and surrounding us, then we all piled into jeeps and drove by caravan to the beautiful large fig tree which stands tall and majestic on the rim of the caldera. Visible from most parts of the crater, this tree would mark the location of our very special event. We arrived at the spot which was still embraced in fog. As the gentle early morning winds nudged up the crater wall, the fog lifted and revealed the incredible setting for our ceremony. For the wedding party, I was accompanied by three beautiful women in colorful Swahili dress, and my groom was accompanied by three handsome men also in traditional Swahili attire. Waiting at the site to welcome us with song, the local Maasai villagers! We were introduced to the magistrate - a small man who had traveled by foot from his village to officiate our wedding. Knowing we were westerners, he had dressed in his very best western attire for the occasion - denim blue jeans, a red holiday sweater, and a Reebok baseball cap. "There are three types of marriages: one that is monogamous, with one; one that is polygamous, with many; and one that is potentially polygamous, the first of many. You must declare which type of marriage you are making here today." Giggles and laughter ensued, as we gave considerable thought to "potentially polygamous", just for kicks, knowing that it would only translate into one type of marriage back home. We marked the box, signed our names, exchanged vows, kissed, and toasted with champagne. All the while the cameras flashed and every one in attendance seemed to have a Swahili blessing to shout out! But the recurring word "paparazzi" strewn throughout the Swahili words was unmistakable, followed by buckles of laughter - apparently the hotel manager took great pride in being asked to take pictures with my camera for us. Had we understood more Swahili, we'd probably have been laughing a whole lot more, but as it was, we could not keep from wearing ear to ear grins. My cheeks are still hurting. After the signing, vowing, and legalities were done with, we were presented with gifts from the Maasai guests. I was adorned with a beaded bracelet, and my husband a beaded necklace to wear, indicating he is married. Then I was handed a stick which only married women can carry. My husband was also given a stick, more of a beaded club, which he was to use for cattle raids. Then I was presented with a gourd, decorated with beads and a leather handle. They explained that this is used to hold blood and goat's milk to "nourish little ones." Thankfully, I was not expected to drink it until "later....when it is time....."
The cake arrived, and we managed to cut small pieces to exchange...but chewing it was another feat. Then a breakfast buffet awaited, with the hotel chef preparing eggs to order, and everything from cereal to fresh fruits to coffee. We could barely eat with all the excitement, not to mention everyone watching our every move and taking pictures...our wedding paparazzi party. After breakfast, the Maasai continued with celebratory song. The men wore red kangas and had elaborately decorated earlobes and necklaces around their necks. The "elder"male leading the group had tinges of red henna in his hair. For the most part, they all stood around leaning on their sticks. The females were much younger - it seemed only the unmarried girls were allowed to attend. They sang beautifully; it was as if the melodic voices rang out from their hearts, as their faces and lips barely moved at all. They wore around their necks wide beaded disk necklaces, which flapped up and down to the beat of the men's drumming. Strings of beads adorned the girls' foreheads. I felt truly honored that these were our wedding guests, who had allowed us to marry on their sacred land of the Ngorongoro Crater next to the giant ancestral fig tree. We were, in fact, their guests. And what an honor it was. A very special honor for which we were extremely grateful. The wedding party escorted us back to our jeep, which they had cleverly decorated with a "JUST MARRIED" sign on the back window. Brilliant. They all squeezed into the back of the jeep with us, on laps and in bundles, singing a traditional wedding celebration song, including each of our names in the verses. A few remaining staff chased the vehicle waving palm fronds, singing, and laughing. It was so joyous, we were surrounded with music, smiles, and positive wishes and energy. Upon arrival back at the Serena Lodge, EVERYONE was standing outside to welcome us as husband and wife. The Maasai danced again, creating a directional path for us to walk while onlookers cheered and took pictures. We felt like royalty. After a few steps I could no longer contain myself, and the tears began to flow - tears of overwhelming happiness and gratitude. We were lead, escorted, and followed by the bouncing Maasai, the singing hotel staff, and the colorful wedding party attendants to the lobby, where even more hotel guests watched and congratulated us. We sat to sign the guest book as "Mr. & Mrs." while the young Maasai girls bounced and sang behind us. Then the entire party lead, escorted, and followed us back to our Kimba Suite, bouncing so heavily that there was concern the board planks of the walkways might break! At last we reached our door, where we turned and thanked everyone with hugs, teary eyes, and endless "Asenteni" (thanks). THANK YOU for reading my story, and sharing in the joy, wonder, and appreciation of a dream come true, a dream made possible by people in a far away land. Gratitude means counting my blessings, big and small, extraordinary and ordinary....and I have far too many not to pass along, share, and give back in whatever way I can. Here's wishing you a heart full of gratitude for blessings big and small, on Thanksgiving Day and every day. Asante sana. What an event to treasure forever. What an incredibly beautiful place to have a wedding - and to have the Maasai involved in the ceremony must have been so moving. What a fabulous wedding story...really one of the best ones I have ever heard! Happy Anniversary and Happy Thanksgiving! just curious...have you ever returned? Tanzania is an incredible destination my wife and I loved it so much when we went on safari last year. Thank you so much for sharing this post! The third option makes the most sense ;-) A lovely story KW.